Metallics have been a favorite in modern interior design for a few years, and that’s not likely to change in the near future. They have a certain edge that adds attitude and sophistication simultaneously. Metallics come in many forms, and they can be overdone if you don’t know what you’re doing. So we’re here to help! As with any new interior accent, you should start small if you haven’t done metallics before. Try changing some of your hardware first – this will be subtle and almost never is overpowering. The kitchen and bathroom are the most likely places that you’ll see metallics in any room, so why not upgrade your cabinet handles and even some kitchen appliances to stunning chrome or silver? From here, you can branch out if you like the look of the metallics you’ve incorporated thus far. Candleholders are a favorite here at the Padstyle office. If you add a few metallic candleholders to your dining room table, they’ll stun guests the next time they’re lit. The bouncing flame reflecting off the mirrored metallic surface is a sight to be seen. When choosing the type of metallic candleholder, keep candle color in mind: cool candles like blue and green should be paired with silver or chrome holders, and warm candles like red or orange look best with gold or bronze. White candles look great with anything. 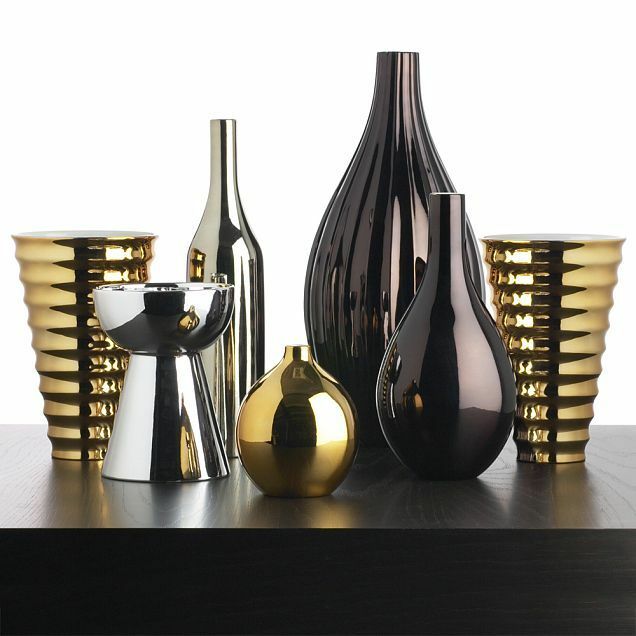 Metallic vases are also another accent piece you could consider. They come in all shapes and sizes, from tabletop vases for a single flower to floor vases. Successfully decorating with metallics just takes a little creativity and a willingness to experiment.